It’s 1967 and Paul McCartney has just woken up in his London home. He steps outside with his morning cuppa to survey the day. It’s fairly cold, having rained the night before, so he wastes no time in returning to the comfort of his living room, but as he turns around he’s halted by what he sees before him. The three words are crudely marked onto the previously pristine white wall that surrounds his home. He shrugs and goes inside. As the great man has just released his own version of "White Christmas", I feel it’s time that we take a detailed look at Eric Clapton’s five-decade-long career. What created the legend? How has he influenced music? Is his influence still present? 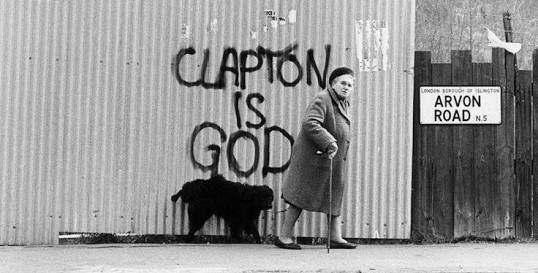 “Clapton is God”. These words are destined to be uttered by at least one person at a party as soon as ‘Layla’ or ‘Sunshine Of Your Love’ is played until the end of time. How did it start? The first known written form of the phrase (above) was photographed in the mid-60s on a wall of the underground station in Islington, London. The phrase, thanks to this famous photograph, soon became the cry of music lovers all over Britain, inspiring some great modern myths, like the one written at the beginning of this piece! Alas, it isn’t true, but how brilliant would it be if it was? Clapton’s fame really began during his stint in the Yardbirds. His bluesy licks quickly caught the attention of scores of music lovers and in turn created a strong cult following. Soon after The Yardbirds, he joined John Mayall & The Bluesbreakers and refined his sound. Swapping his Telecaster for a Les Paul and Marshal amplifier combination transformed him from a lead guitarist to a phenomenon. He had a become a household name (something he never really wanted to be). Once Clapton joined forces with Ginger Baker and Jack Bruce, Cream was born. Truly one of the most pivotal moments in his career, Clapton was given the opportunity to explore every avenue of his delta blues influences. He also experimented with different guitar, amp and effect unit combinations. It was at this time that his famous “Woman Tone” was created. Rolling the tone knob of his Gibson SG all the way down and cranking his Marshal open back amplifier to breaking point produced a warm, fuzzy haze, and when mixed with Clapton’s emotive technique, it left audiences begging for more. Before Hendrix arrived, Eric Clapton was pushing the boundaries of what the electric guitar was capable of. Sadly, Clapton’s influence over today’s world of Popular music is largely diminished, if not gone completely, however, it is comforting to know that he’s most likely pretty happy with that arrangement. Where Clapton’s legacy will live on for as long as people listen to music, is the world of the Blues. No Blues guitarist for the last thirty years, myself included, can’t cite Eric Clapton as a strong influence. His approach to the Blues has resonated with generations of music lovers and musicians alike. Over his fifty-year career, Clapton has been awarded 18 Grammys, a Brit Award for his contribution to music and a CBE (Commander of the Order of the British Empire). Not bad for a boy from Surrey. Eric Clapton has forever cemented himself into the world of Guitar. Matthew Rudd is a Cape Town-based Singer, Song-writer, Session Guitarist and Writer.